Home Board index General Your adventures..
Has The Forum Died? Been Anywhere on your Kato? Re: Has The Forum Died? Been Anywhere on your Kato? In order of substantive stops: Glen Innes, Armidale, Scone, Rylstone, Sofala, Neville, Woodstock, Neville, Lithgow, Woy Woy, Gloucester, Uralla. Just over 2000 kays in five days. Some pics below. On the way home to Brisvegas today via Bruxner and Mt Lindesay highways. Tourist bimble from Cleveland to Wellington Point, then Wynnum Esplanade for a coffee. Been on a cruise for five days and had to get out on the bike somewhere, anywhere. Hoping to do a day loop up to Sunshine Coast hinterland next weekend. Cheers all...... nice pics...... once again I was due to throw a leg over (to ride in to get my recalls done ) but have been struggling with another virus or weird heat/dust/whatever effect..... I'm ok but not as good as last week...... dang it, just bad timing...... oh well - re-booked for the 24th and a couple of long term super friends are available to ride with me so long as I buy the coffee . Hey, Mrs Lackloin ...... you were only a km away from my place when you parked on the Wynnum foreshore last Saturday. (looks like the wading pool precinct)...... I was having coffee with my elders down Springwood way in the morning (car), and came home feeling a bit off (suspected virus) and wasted the weekend being careful and resting..... ......I might be a bit of a WUSS but it is scary pale face, tummy discomfort, stingy eyes, tiredness stuff that reminds me of my pre-heart bypass symptoms.. Between the bust ankle*, the thick end of a month in Aus, and crappy British weather when I got back, I just couldn't be arsed to ride. Anyway, I won't bother with photos or a writeup, cos it wasn't on a KTM - I finally sold my knackered SMT to a fellow hillclimber late last year, after almost two years gathering dust in the garage. But the weather's perking up, I've got a couple of Brexit-busting foreign trips planned in the next six months, and I can't bring myself to socialise with other beemer owners, so I'm still kinda here. No pics...cause, well, I'm still riding. Had to stop for about 3 weeks while the roads were too icy but rode the last week to work in the pouring rain and wind. My Co-workers thought I was completely bonkers. When asked why (this happened many times) I said "it's not like I get wet beneath my suit". They don't get it. They have no idea how much fun it is! Well my wife and I are always out riding and to make sure that we keep it up we’ve just purchased some new ones. 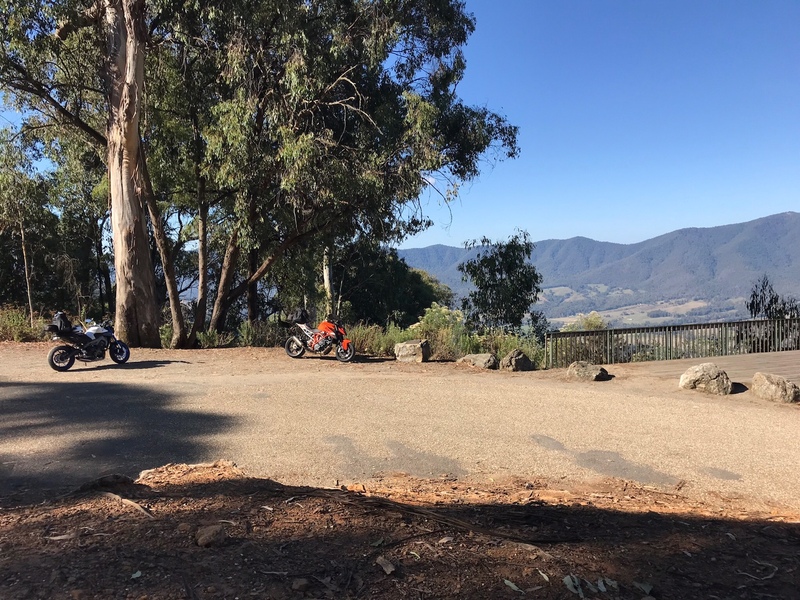 Here is some photos from a week ago on our trip on the older bikes. 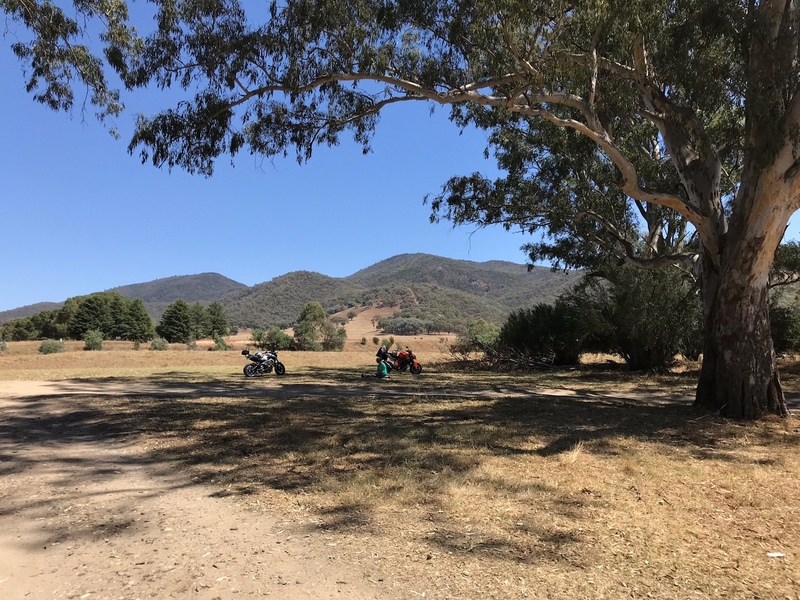 Hey, those pics - that would be the lookout at MT Buffalo if my memory is correct..... biking paradise around Bright . No worries Davo, I will keep you informed about the suspension as yes it needs to settle in first. I set up my SDR in sports mode and it’s a cracker of a bike and is a little different to this but I love the newbie and handles like a dream. Anyway..... nice upgrade to SDGT.... very solid windscreen mount, neat little side pockets that flip out to open and that big TFT screen (which I didn't get to see powered on). It's a demo bike for those in Brisbane's south, so keep in mind these things are a bit rough when new and super tight...... they become almost totally different after 5000kms or so.... nicely loosened up engine, suspension etc..... but a test ride shows the brakes and power and confirms the fit/comfort (I'd select sport map & street damping to help with traffic). I suspect it also has the 38 tooth Euro rear final gearing so it probably also needs a 40t sprox (unless the engine changes - heavier crank, titanium valves etc - make a big difference to the smoothness <4k rpms). So not much of a ride to report...... but then again, it was one giant leap for me! Cured the fuel cons by removing my ESE dongle and plugging back into the Exup connector..... back to 20k/ltr legal speed cruising ........ but the engine check lamp was still on....... later I discovered my +ve battery terminal was only nip tight, not proper ring spanner tight ...... hoping that will resolve the issue. So another giant leap for me...... damn I wish I had taken a pic..... it was very nice at the cafe beside the boat harbour...... beautiful day, flash looking boats..... and my SDGT looked good too! Indeed - perfect weather for riding. 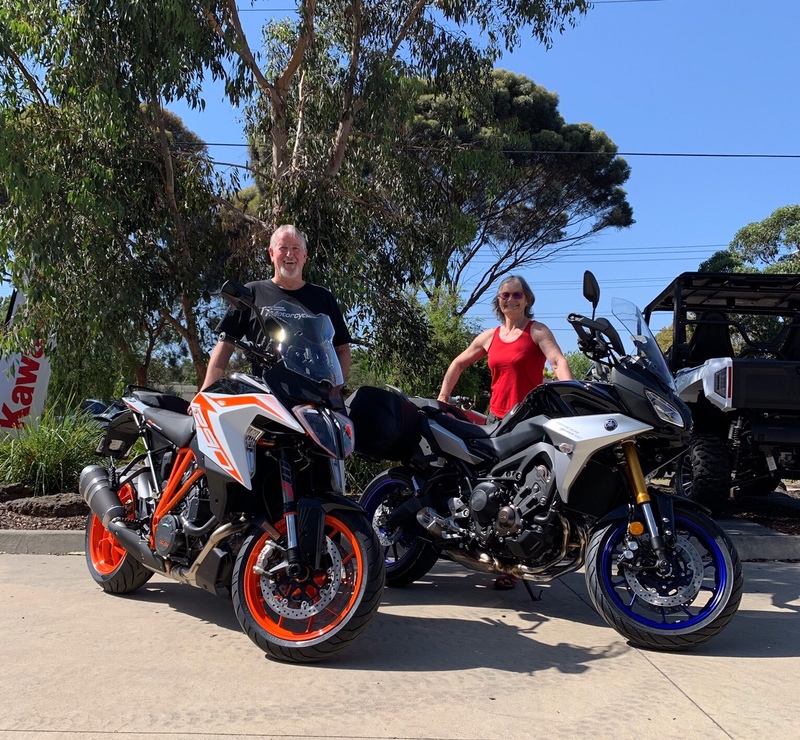 Took ours out for a weekend 1000 km round trip out into the SA countryside - first trip with the new 40t rear sprocket and post 1000km service. Definitely an improvement with 6th gear at 110km/hr now actually possible (just). So the 19 still has slightly tall Euro oem gearing...... typical eh? Just had a thought (well, 2 actually)...... it will get easier as the kms accumulate (no BS), mine is silky smooth (for a twin) at 11400kms, and a question - did you put the sprocket on yourself? I ask, because, the super sprox (and any other brand) must fit one way only, but there is no instruction warning. The pretty machined/beveled side must go toward the hub to line the sprocket up perfectly with the front cog. It's still too cold for me to travel, but I'm getting ready. This winter, I gained too many pounds by tasting home-made beer and playing at https://duckdice.io/lottery I'm afraid I will have to make an intensive schedule for the warm season. By the way, you did not notice that lately, I don't want to take pictures. I seem to forget about it. Yes - got the dealer to do it when I had it serviced. Joking said to them as I collected the keys "you did get the sprocket the right way round didnt you?". Checked the bike myself and ... sure enough.. sprocket the wrong way round! - even the dealer gets it wrong! Aaaaagh, I didn't take a pic again... .... Ride #3 to KTM service shop on Saturday morning...... and I think I spotted Mrslackloin's pretty SDGT with Ackra muffler parked outside the service shop door while mine was still hiding inside beside the counter......... along with a white 19GT in for it's 1000k check (1290GT Central eh ).